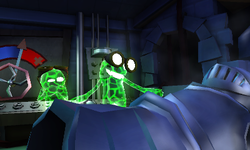 The Underground Lab is a room in Treacherous Mansion in Luigi's Mansion: Dark Moon. Accessible via the Haunted Catacombs (both parts of it), it's a laboratory style room with an operating table, a suit of armour lying on said table and an unknown piece of machinery that hits said suit of armour with lightning when activated. There are also some vases on the shelves around the room that have things like a gem inside. In Front-Door Key, Luigi has to pass through the Underground Lab in his hunt for the Polterpup that took said key. However, the room turns out to be inhabited by some Strong Greenies which must be defeated before Luigi can exit the area. He also finds the mission's Boo in said room by turning on the machine and striking the suit of armour with a blast of electricity. In the other missions aside from Terrifying Invasion, the Underground Lab is inaccessible like the rest of the Treacherous Mansion basement. The scene where two Strong Greenies bring a harness to life with electricity is a reference to the film version of Frankenstein. This page was last edited on October 23, 2018, at 13:15.